Over winter vacation, I traveled to Japan to celebrate the wedding of a dear friend whom I have known since I was ten years old. During the frenzy of wedding festivities, I managed to find time to frequent a few of Tokyo’s many cultural institutions such as the Suntory Museum of Art and 21_21 Design Sight. Of the many venues whose art I admired, one remains most memorable: the Yayoi Kusama Museum in the Tokyo neighborhood of Shinjuku. Founded by Yayoi Kusama in 2017, the Museum presents two annual exhibitions as well as lectures and other events on contemporary art. Yayoi Kusama is an avant-garde artist. Born in 1929 in Matsumoto City, Nagano Prefecture, Kusama is best known for her techniques of obsessive repetition and multiplication of single motifs. The Museum is comprised of five floors open to visitors. Upon approaching the futuristic building, an artistic piece in and of itself, one is met by a staff member who scans the museum-goer’s ticket (For those interested in visiting the Yayoi Kusama on their next, or first, visit to Tokyo, please make sure to purchase a ticket in advance). Once inside the Museum’s reception area, I perused the items on display in the charming gift shop. I then began my odyssey through Kusama’s unique visual world, ascending the stairs to view her current exhibition “I Want You to Look at My Prospects for the Future: Plants and I” (on display until Thursday, February 28, 2019). Photography was only allowed on the first, fourth, and fifth floors. Like most members of Generation Z, I took a plethora of pictures. 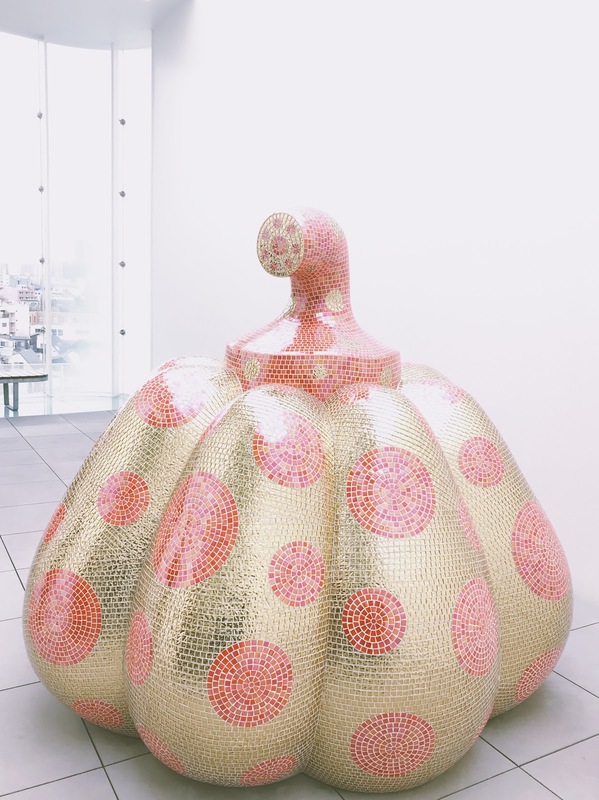 The exhibition features different iterations of Kusama’s iconic pumpkin. One part of the exhibition includes a room in which visitors are initially enveloped in darkness. As time elapses, the room begins to light up, one “black-and-yellow-polka-dotted” pumpkin at a time. The final segment of the exhibition is an outdoor sculpture of a pumpkin. In all its mosaic glory, the pink and golden pumpkin statue is candy for the eye and a pleasure to behold. 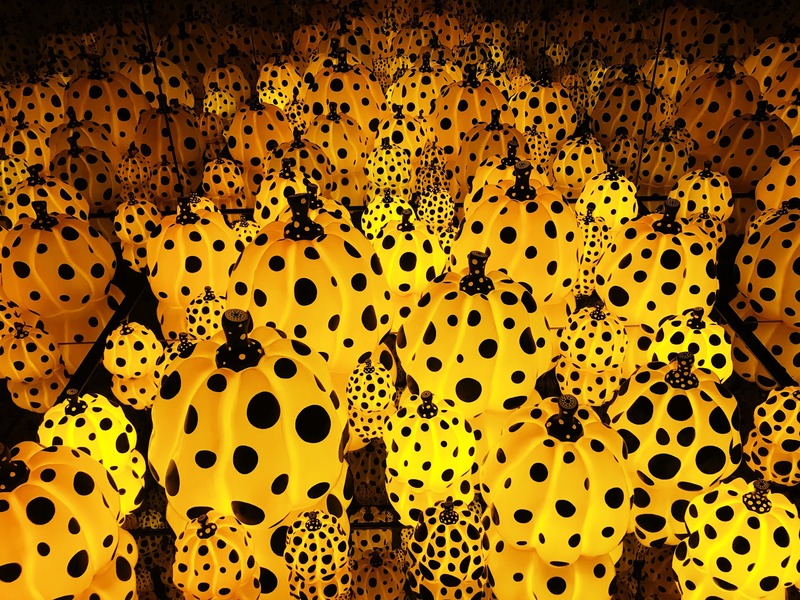 A visit to the Yayoi Kusama museum makes for a wonderful day. After experiencing Kusama’s modern art, I recommend going around the corner to the Natsume Sōseki Museum. Sōseki was a Japanese novelist best known for his novels Kokoro, Botchan, and I Am a Cat. Immerse yourself in the world of classic Japanese literature and indulge in some matcha at the museum’s CAFE SOSEKI. Enjoy!